TIM MAIA: WORLD PSYCHEDELIC CLASSICS 4: NOBODY CAN LIVE FOREVER: THE EXISTENTIAL SOUL OF TIM MAIA. Tim Maia was unlike most singers. Not only was he hugely talented and charismatic, but each day, he lived life on the edge. Defiantly, Tim Maia lived each day as if it was his last. By then, he was a cult hero in his native Brazil; and was living life in the fast lane. He was enjoying living hedonist lifestyle. Life was for living seemed to be Tim Maia’s motto. Realising that he was only here for a visit, Tim Maia embraced the rock ‘n’ roll lifestyle. Occasionally, Tim Maia’s chequered lifestyle sometimes caught up with him. Most of the time, this didn’t affect his music. That’s why nowadays, Tim Maia is regarded as one of the most talented Brazilian singers of his generation. A reminder of this music can be found on the recently released Luaka Bop compilation Tim Maia: World Psychedelic Classics 4: Nobody Can Live Forever: The Existential Soul Of Tim Maia. It documents and celebrates the almost surreal and sometimes psychedelic life and adventures of Tim Maia. Tim Maia couldn’t have timed the release of his debut alum Tim Maia better. It was 1970, Brazilian music was about to reach the peak of its popularity. To help consolidate the music’s popularity and get people talking about it, what was needed was an artist whose personality wasn’t just larger than life, but bigger than that. In Tim Maia they found just the artist. Here was a man who was married five times, had six children and spent time in prison. Then there was his rock and roll lifestyle. Copious amounts of drugs and alcohol were part of Tim Maia’s diet. Whether this played its part in Tim joining a cult obsessed by UFOs is unknown. Yet despite Tim’s obsessive pursuit of hedonism, excess and a rock and roll lifestyle, he still managed to make some incredible music. Despite the quality of this music, mention Tim Maia’s name and people will say Tim who? That’s a great shame, because not only is Tim’s life a compelling story, but his music deserves a much wider audience. By 1970, Tim Maia was twenty-eight, the eighteenth child in a family of nineteen. Aged just six, Tim earned a living delivering homemade food, which his mother cooked. This would be the nearest Tim got to an ordinary job. Having learnt to play the guitar whilst a child, Tim’s musical career started at aged fifteen. He formed his first band The Sputniks. Then two years later, Tim headed to America, believing this was the land of opportunity. With just twelve dollars in his pocket and unable to speak English, Tim arrived in America. He called himself Jimmy at customs, and bluffed his way into the country, saying he was a student. Living with extended family in Tarrytown, New York Tim worked various casual jobs and augmented his meagre earnings by allegedly, committing petting crimes. Soon, he learnt to speak and sing English. This lead to him forming a vocal group The Ideals, who recorded one of Tim’s songs. Having planned on never returning home to Brazil, things went wrong for Tim in 1964. He was caught in a stolen car in Daytona, Florida. After serving six months in prison, Tim was deported back to Brazil. Even then, Tim Maia liked living life on the edge. Now back in Brazil, Tim Maia had to kickstart his nascent musical career. During his time away from Brazil, times and music had changed. Then Tim had a break, when Elis Regina became entranced by his song These Are the Songs. It had been released as a single, but she she asked Tim to duet with her on the song. They recorded the song in English and Portuguese, and the song featured on Elis’ 1970 album Em Pieno Veroa. This gave Tim’s career a huge boost. Recording with such a famous Brazilian singer lead to Tim signing a recording contract. His debut eponymous debut album Tim Maia, spent twenty-four weeks on the Brazilian charts. His music was something of a game-changer for Brazilian music. Never before had soul and funk music been combined with Brazilian music. Now soul and bossa nova and funk and baiao became intrinsically linked. They intertwined. Two nation’s musical styles and heritage’s became one. It was a fusion of cultures and musical genres. This musical melting pot marked Tim Maia’s entrance to Brazilian music. Soon, Tim Maia was at the vanguard of a new musical movement, Black Rio. This new Afro-Brazilian musical and cultural movement was heavily influenced by the American civil rights movement. However, for Tim party politics didn’t interest him, but partying did. He was at heart a pleasure seeker, a hedonist and out to enjoy life. For Tim, music wasn’t about changing the world, but having a good time. Ever the contrarian, each of Tim’s albums were entitled Tim Maia. He wrote and recorded in English and Portuguese. Maybe by writing songs in English, Tim had an eye on crossing over into the American and European markets. Then in 1971, flushed by the commercial success of his debut album, Tim decided to head to London. In London, Tim celebrated his newfound success. There he enjoyed the rock and roll excesses. Drink and drugs were his way of celebrating his success. One of the drugs he discovered, like many had discovered to their cost, would prove to be his undoing. In London, Tim discovered L.S.D. He became an advocate of its supposed mind opening qualities. He took two-hundred tabs of L.S.D. home to Brazil, giving it to friend and people at his record label. Little did Tim know, but this was like pressing the self-destruct button. Three years later, in 1974 and just as Tim was finishing his fifth album, he discovered and joined a religious cult, the cult of Rational Energy, who fixated on UFOs. Tim was now clean-shaved, dressed in white and no longer drank, ate red meat, smoked or took drugs. Always in his hand was a mysterious book. Even his music changed. From his fifth album Racional, Tim’s music reflected the change in his personality and character. While his voice improved from Racional, the lyrics made no sense. Then in 1976, Tim quit the cult. When Tim quit the cult, after Racional Volume 2, he’d fallen out with its leader. He felt duped and wanted the two Ratconal albums destroyed. His music changed from his first post-Racional album, entitled Tim Maia, released in 1976. From 1976 onwards, Tim Maia continued to release albums through the rest of the seventies, eighties and nineties. While albums kept on coming, his shows were hit and miss affairs. Sometimes he’d turn up, play an outstanding set, other times he’d play a mediocre or shambling set. On many occasions, he’d fail to turn up. He returned to is rock and roll lifestyle, living life to the fullest. His final album was Nova Era Glacial, released in 1995. Sadly three years later, Tim died in March 1998. His shows and behavior had become predictable since his 1976 post-Racional comeback. Since his death, Tim Maia’s music has been a well-kept secret, spoken about in hushed tones. Like many maverick musicians, Tim Maia’s story sees myth and reality become intertwined. Truth and reality become one, just like his music was fusion of influences and musical genres. You’ll realize this, when I tell you about some of the highlights of Tim Maia: World Psychedelic Classics 4: Nobody Can Live Forever: The Existential Soul of Tim Maia. 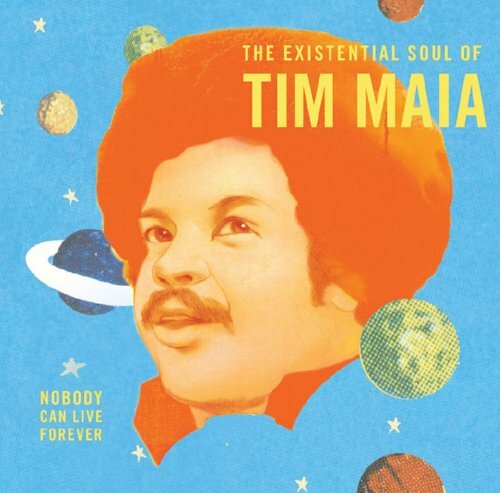 As Que Beleza which opens Tim Maia: World Psychedelic Classics 4: Nobody Can Live Forever: The Existential Soul of Tim Maia, is a horn driven funky track, begins where Latin music, jazz and classic rock combines. Horns add funk and jazz, while the percussion adds an authentic taste of Brazilian music and searing, soaring Santana-esque guitars add a rocky, Latin twist. Tim’s vocal supplies the soul. His vocal is heartfelt, delivered in Portuguese, with dramatic horns replying to his call. It’s a compelling, captivating melting pot of influences and musical genres, that’s the perfect introduction to Tim Maia’s music. Not only does it whet your appetite, but leaves you hungrily wanting more, much more. 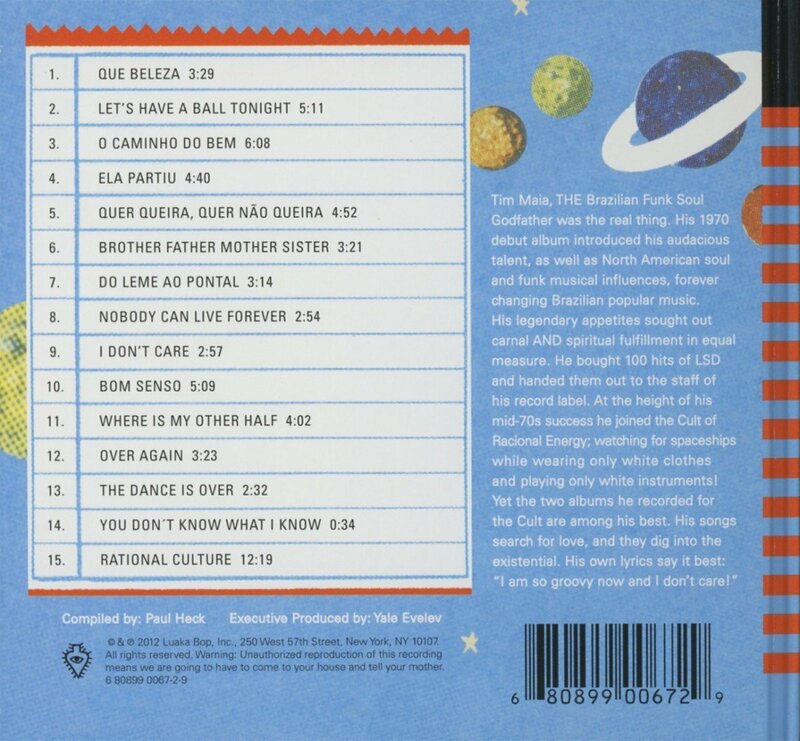 Of the fifteen tracks on the compilation, Let’s Have a Ball Tonight epitomises Tim’s carefree, hedonistic attitude. He makes it clear politics, aren’t his bag. Instead “love is the answer.” He combines funk, soul, psychedelia and Latin music. His half-spoken, emotive vocal is sung against an arrangement that’s a slow, fusion of styles. There’s even a bluesy sound to the tracks, where the rhythm section, chiming guitars, percussion and Hammond organ prove the perfect foil to Tim’s vocal, which references Jimi Hendrix, Bob Dylan, gospel and soul music. Soon, he’s like a preacher, winning over and converting the nonbelievers. This is the track, that’ll win converts to Tim Maia’s music. One listen and they’ll become believers. Given how American soul music influenced Tim Maia’s music, I wonder whether Brother Father Mother Sister is Tim paying homage to the hottest house-band of the seventies, M.F.S.B, known as Mother, Father, Sister, Brother. With cascading strings, chiming guitar’s that pay tribute to Philly’s finest, this is one Tim’s Magnus Opus. His vocal is deliberate, accentuating and annunciating the lyrics. If you listen carefully, you’ll realise these lyrics are some of his best. Combine all this, and not only is this a track that’s soulfulness personified, but it’s dance-floor friendly and infectiously catchy. Nobody Can Live Forever sees pounding drums and percussion combine, before a Hammond organ ushers in Tim’s Jimi Hendrix style vocal. Tim’s delivery has a similar, deliberate style. As Tim sings “Nobody Can Live Forever,” the lyrics take on a poignancy, given his early death. The band fill the space left by his vocal, using waves of gloriously, repetitive, pensive rocky licks. Moody, thoughtful and melancholy, this track is all that and much more, including outstanding. I Don’t Care sees another side to Tim Maia when the track opens. There’s a moody, despairing sound before the arrangement bursts into life. Tim, openly defiant unleashes a vocal that’s cascades, soulfulness, despair and bravado combining. The arrangement is similarly dramatic and wistful. Strings sweep and swirl dramatically, horns rasp emotively and the rhythm section build the tension. They provide a fitting backdrop to a vocal that’s tinged with desperation, but openly defiant. In many ways, it’s poignant, given it could be almost autobiographical. Over Again is a much more uptempo track. Percussion, keyboards and rhythm section combine before Tim’s vocal enters. There are similarities to Terry Callier and Tim Buckley in Tim’s vocal. Accompanying Tim are tight, sweeping harmonies, that are the perfect foil to his vocal. They match him for soulfulness. Joining them are the lushest of strings, bursts of blazing horns and an atmospheric wailing Hammond organ. The finishing touch are the rhythm section, which provide the track’s heartbeat, adding bursts of drama. It’s a glorious combination of soul, funk and rock, where Tim Maia lays bare his soul for all to hear. My final choice from Tim Maia: World Psychedelic Classics 4: Nobody Can Live Forever: The Existential Soul of Tim Maia is The Dance is Over. Fittingly, features one of Tim’s most heartfelt, emotive vocals. It’s as if the lyrics are personal, describing Tim’s life and attitude to it. Flourishes of cascading strings are key to the arrangement, before after a minute, a Hendrix style guitar solo is unleashed. Not only does this grab your attention, but sets up Tim’s vocal. Although melancholy mingles with hope and hedonism, you wonder who the real Tim Maia is? Is he really this hedonistic, thrill-seeker who seemed hell-bent on living life on the edge, or was he someone who in reality, was insecure and introspective and was looking for answers? Listening to Tim Maia: World Psychedelic Classics 4: Nobody Can Live Forever: The Existential Soul of Tim Maia and researching his life, I’ve come to the conclusion that like many maverick singer-songwriters, Tim Maia was touched by genius but fundamentally flawed. He could’ve, and should’ve, been a huge star. Sadly, something held him back. It stopped him from receiving the commercial success and critical acclaim his music richly deserved. This was music shaped by a multiplicity of musical influences, genres and of course, his lifestyle. His music is a compelling, captivating fusion influences and musical genres. Everything from soul, funk, jazz, rock, bossa nova and baiao thrown into Tim Maia’s mystical and psychedelic musical melting pot. Similarly, Tim’s lifestyle including drink, drugs, multiple-marriages and imprisonment all shaped and influenced Tim Maia’s music. It’s then given a stir by one of music’s true maverick’s, who on the verge of critical acclaim and commercial success, made a couple of decisions he would later come to regret. The first of these was Tim’s dalliance with L.S.D. in 1971. If that was his first mistake, his second was definitely, his decision to join a cult derailed his career. Maybe if Tim had never celebrated his success in London, then things might have been very different. Somewhat ironically, given the amount of music Tim Maia recorded and released, the two albums he recorded during his time with cult, have gained cult status. These two albums, were just a snapshot of his career, but one that affected his future. After leaving the cult, Tim continued releasing music, but his live shows became unpredictable. They were either outstanding, mediocre or didn’t happen. All this fueled the mythology that surrounds Tim Maia. In a cruel and tragic twist of fate, Tim Maia died young, like many maverick musicians. He was just fifty-five when he died in 1998. Since then, the mythology and rumors surrounding Tim have increased, as has his popularity. Now belatedly, Tim Maia’s music is enjoying an Indian summer. So for anyone yet to discover the delights of Tim Maia’s music, then they’ve a majestic, musical journey ahead of them. The best place to start is quite simply Tim Maia: World Psychedelic Classics 4: Nobody Can Live Forever: The Existential Soul of Tim Maia. It’s the perfect primer and introduction to a Tim Maia, who lived life on the edge, exuberantly reveling in the excesses of the rock and roll lifestyle. Maybe without living his life in the way he did, his music wouldn’t have been either as memorable, magical, eclectic and timeless. So maybe we should be thankful that Tim Maia was both touched by genius and fundamentally flawed. .
← WILLIAM ONYEAEBOR MUSICIAN AND MAN OF MYSTERY.